Superstitions are a part of many cultures and nations, and Belarusian culture is no exception. And although a lot of them go way back and used to have at least some rational basis, most superstitions are now obviously no longer relevant. Yet people adhere to them like sacred commandments. For example, almost every child is careful never to whistle in the house – that blows all your money away! And don’t ever pass things over a threshold – that means instant trouble! Or how about this very special one for the unmarried ladies – don’t sit at the corner of a table, or you won’t be able to get married for at least another 7 years! But it’s not all scary, there are superstitions that give protection and are positive in other ways: one rather typical Belarusian superstition is the well-known Ruchniks – narrow cloths embroidered in red on white – which have long been thought to have protective qualities, like amulets against evil. You can buy a Ruchnik as a cloth (to cover bread), a towel or a scarf and walk safely through the streets. Another very commonly used superstition is the ‘sneeze for the truth’. When someone sneezes, they confirm what has just been said. Belarusians then say ‘eta pravda’: which means ‘that is true’. So even if someone says the craziest thing ever, like ‘3 million tourists will visit Belarus in 2018’, and someone else sneezes immediately afterwards, it means that 3 million tourists will visit Belarus in 2018. Time to sneeze! It is bad luck to illustrate a Shocking or negative concept on your own body. Don’t show it on yourself! Never pass, greet or say goodbye to someone over a threshold. That’s bad luck for you! Never place an empty bottle on a table. Bad luck again. 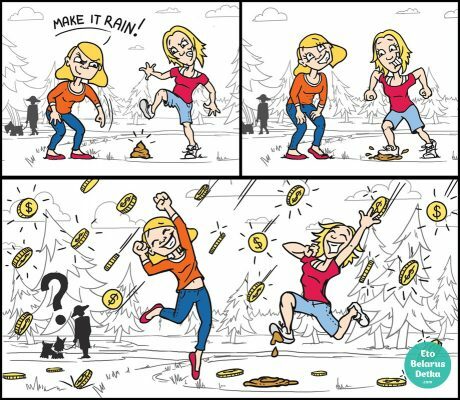 Dog poo is good, dog poo means more money. So go ahead and stand in it as much as you like. Same goes for bird poo. Sit down before going on a trip. This will assure you of a safe trip. Putting your clothes on backwards or inside-out means that you might get hurt today, So you better take them off, step on them slightly and put them back on. Does your nose itch? That means you’re going to have a drink soon! If you unintentionally step on someone’s foot, ask them to step lightly on yours. That will prevent a conflict. But please, don’t do it on public transport, as people may think you are crazy. A simple ‘I am sorry’ will be enough. Find out more about Belarusian cultures on our blog. Summer surprise: NO hot water!